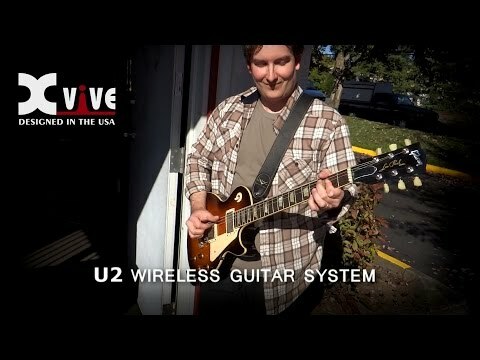 Xvive U2 guitar system features digital wireless technology that delivers incredible audio quality, simple setup, and is extremely reliable for any gigging musicians. It delivers a full 20Hz-20 kHz frequency response, so you’ll hear your guitar tone in great detail with only 6ms of latency. This wireless system operates at 2.4GHz ISM band for crystal clear broadcasting ensuring the integrity of your signal on stage and covers 70 feet of range without any signal dropout. The Li-ion batteries help makes the U2 wireless system environmentally friendly that can last up to 5 hours per charge. The chassis is made out of a durable ABS plastic that can withstand the rigors of touring and the harshest of climates. This wireless is a perfect fit for any pedal board thanks to its simplistic, and compact design. So, go wireless with the Xvive U2 system. It’ll declutter the stage and offers freedom in motion. After connecting successfully, LED lights on receiver will keep light on.